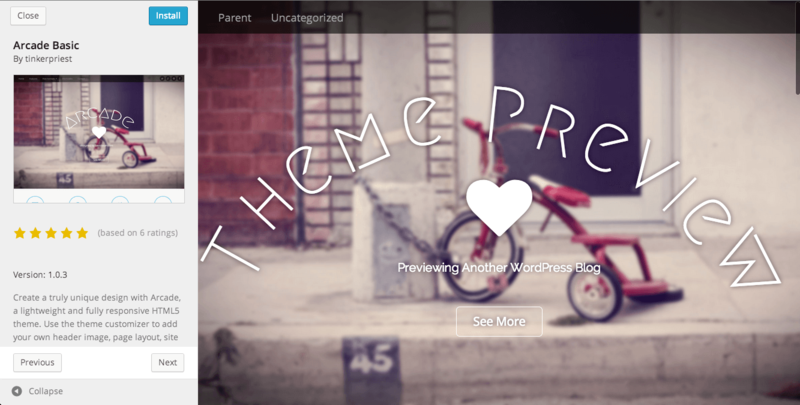 What's New in WordPress 3.9? 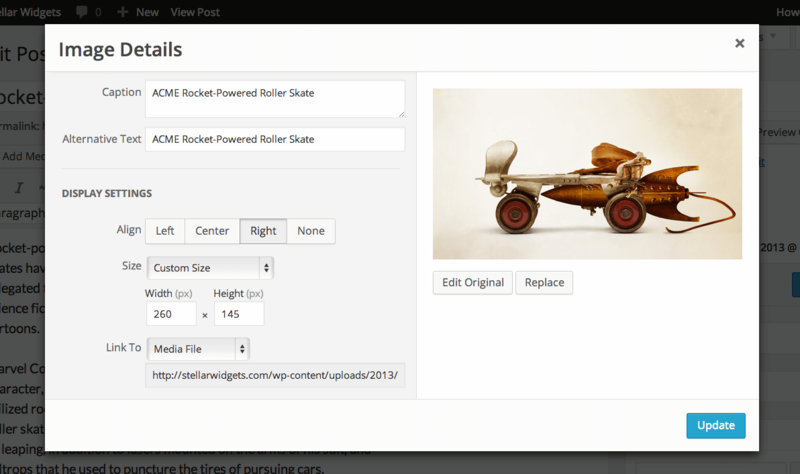 WordPress 3.9 was released yesterday, and brought with it a number of enhancements to the media editing experience. This release was the product of hard work from a record number of contributors (267), and is code-named “Smith” in honor of jazz organist Jimmy Smith. The visual editor has been upgraded to the latest version of TinyMCE, which improves the speed of the editor, accessibility, and better support for mobile devices. You can now easily add a horizontal rule, and the nasty “Paste from Word” function is no longer necessary. Just paste content from your word processor (yes, we’re talking about Microsoft Word) directly into the visual editor. WordPress will clean it automatically. If you frequently add images to your blog posts and pages, you’ll love the new image editing tools. You can now scale images directly in the editor, without having to visit an extra pop-up editor. When you need to edit the image, you’ll find it much easier to crop and rotate your images while editing posts. Drag and drop images directly into the editor! No need to click the “Add Media” button to upload images. 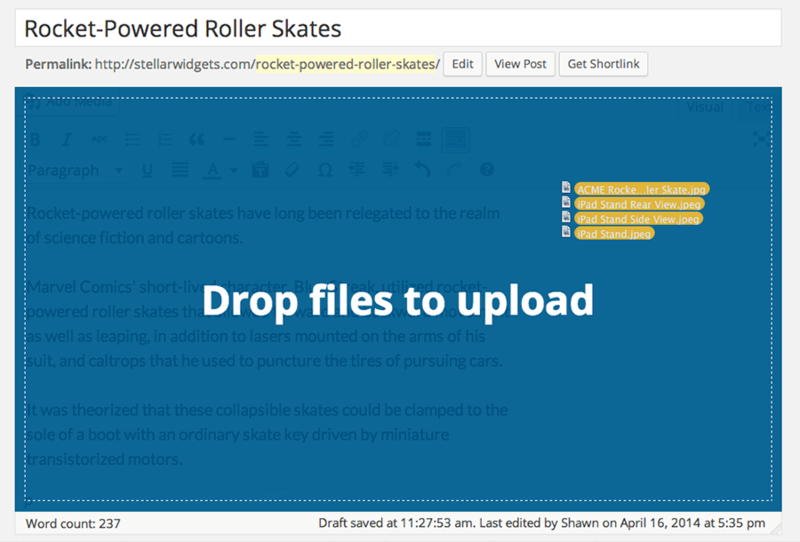 Now, you can just grab them from your desktop and drag them into the editor. Until now, photo galleries were depicted in the editor as a nondescript blue box; to preview what your photo gallery would actually look like in place, you had to visit the post, then return to make changes, go back to see what that looked like… etc. That’s finally a thing of the past! 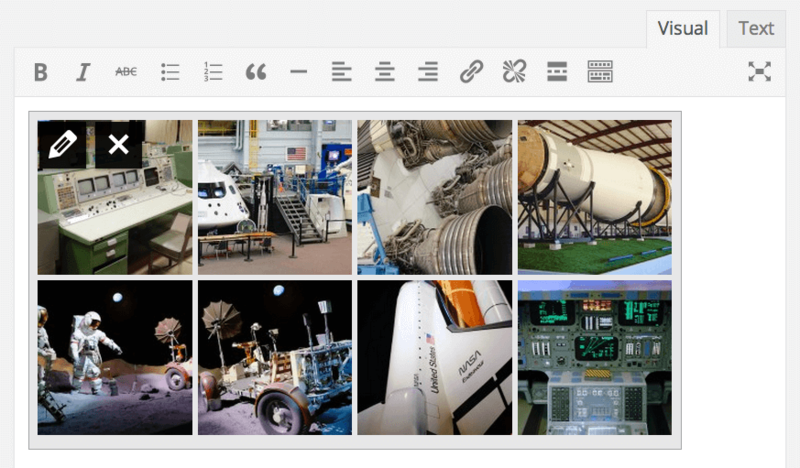 Galleries display a beautiful grid of images right in the editor, just like they will look in your final post. 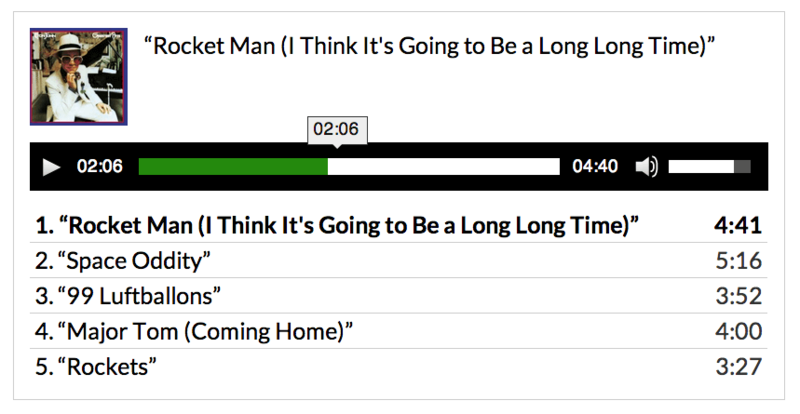 This release also brings support for audio and video playlists, so you can showcase your music and video clips. The process is just as easy as creating a photo gallery, but it’s also quite extensible, with support for additional features through the media options. Check out this post to see just what’s possible. Okay, this just may be my favorite new feature in WordPress 3.9. You can now add, edit, and rearrange your site’s widgets right in the theme customizer, and preview your changes in real-time! No more “save … preview … edit … preview … etc.” — just make your changes live and then save them when you’re happy with the results. This is an enormous time-saver! You’ll also love the improved header image tool, which lets you upload, crop, and manage headers right in the Theme Customizer. There are thousands of themes available on the WordPress Theme Directory, but what good is that if you can’t find the theme you’re looking for? The completely redesigned theme browser makes it easier than ever to browse featured themes, find the newest themes, or even filter search results by color, layout, or other features. You can even browse full-size previews, and when you find a theme you like, install it with just a click. As always, there are also hundreds of tiny improvements that you may never see, but bring increased flexibility for theme and plugin developers. For a more in-depth look at those improvements, check out this post. Yes, our WordPress 101 videos are already updated for 3.9! As always, we began updating and re-recording our video tutorial series as soon as WordPress 3.9 hit the “Release Candidate” phase of development and testing. This enables us to release our updated videos the same day the newest version of WordPress makes its official debut, ensuring you’re always up to date with the latest improvements in WordPress! HINT: Parts 9 and 14 highlight the best new features! WordPress 3.9 is just so much trouble as it has been released without adequate testing and ends up with no visual editor. I simply don’t have the time or inclination to be messing about deactivating plugins and changing the theme that I have spent ages customising and which worked fine before I updated. I wish I had never bothered. I know you don’t want to go through the bother of disabling plugins, but that’s almost certainly the cause of the bug you described. And I do have to disagree with the statement that 3.9 was released “without adequate testing.” That’s simply not true. On the contrary, the development team has been actively encouraging plugin and theme developers to test their products with 3.9 for over a month. The core development team certainly can’t troubleshoot bugs that aren’t reported. Throughout the Release Candidate phases, there were only a handful of bug reports, and those were quickly addressed. With the information available, they made the right decision to release this version. The responsibility lies almost entirely with plugin and theme developers to ensure their products don’t break under the new version. In this case, it appears many, many plugin developers simply couldn’t be bothered to test ahead of time, but chose to wait until after the final release. It’s a shame, because we ALL suffer as a result. I upgraded nearly 60 WordPress sites for my clients and had no issues, but that’s likely because those sites used very few plugins, and only plugins that are very well tested and supported. Thank your for emailing me about the latest developments on WP101. I became a member in September 2012. There were times when I surfed to your site to get some information on wordpress issues and questions. Having not heard from you (in the form of a newsletter or email) I had completely forgotten about WP101, well to say in 2013 onwards. I had a surprise when I received an email from you notifying me about WordPress 3.9. Then I remembered that I had been a member before but did not think that the membership was valid. What a pleasant surprise when I read that membership was for lifetime and never expires! You are a true gentleman as you kept to your word. Had you not reveal this important information on your site I wouldn’t have known about this vital clue about my membership at WP101! Hope you continue to enjoy the new videos and remember, if you have WordPress questions you can always drop by the Q&A Forum and I’ll do my best to answer. Not clear how I get to my desktop from by edit page without the “Add Media” button. I just did it the usual way and it worked fine. Don’t get the short cut the new system is offering. Where should I look for clearer step by step instructions? 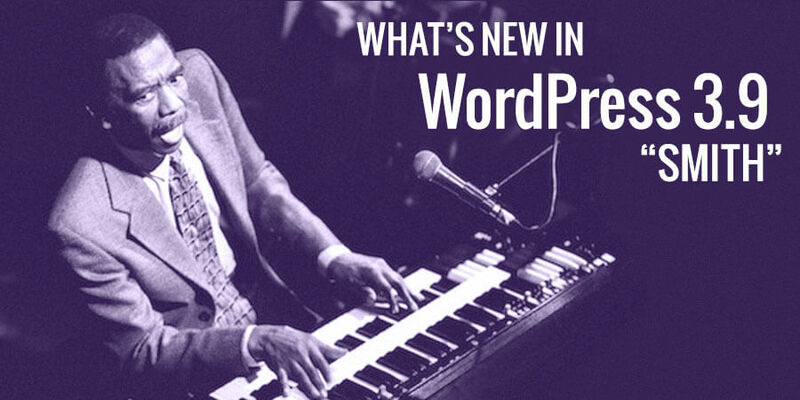 This post is meant to just quickly highlight the new features in WordPress 3.9. For detailed, step-by-step instructions, you’ll want to view our videos.